Ferdinand Piech, left, with clan chief Wolfgang Porsche. Their feud opens the door to power for younger family members. 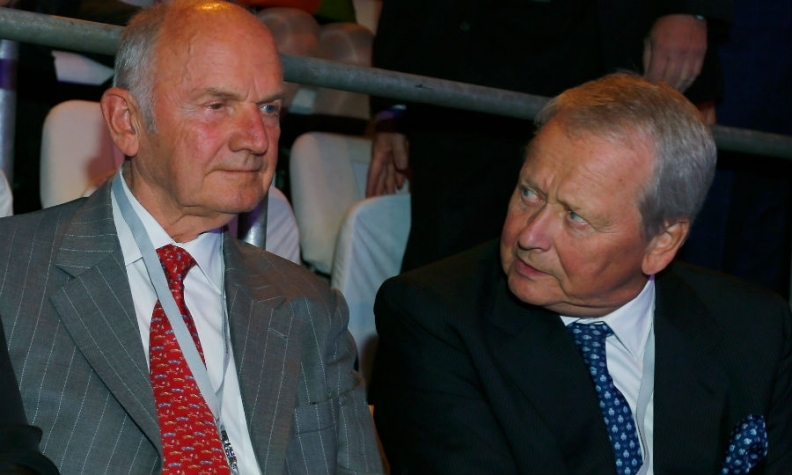 STUTTGART -- Ferdinand Piech's seat on the board of the holding company of Volkswagen Group's majority shareholder could be taken by his nephew, Josef Ahorner. The move would be a step toward the younger generation of the Porsche-Piech clan moving into key roles. As Volkswagen CEO and later chairman over the span of nearly two decades, Piech played a key role in turning VW Group into the world’s largest carmaker. Now after his latest feud with other members of the Porsche-Piech clan, Piech is in talks to sell his 14.7 percent stake in Porsche Automobil Holding SE, the investment vehicle that owns 52 percent of VW Group's voting stock. This means he will lose his claim to a seat on the Porsche SE board. At Porsche SE's annual meeting on May 30, Piech's seat will need to be filled, along with that of his 77-year old cousin Hans Peter Porsche, who is in poor health. Nominations must be sent to shareholders by April 18. Porsche SE's controlling families plan to fill the two seats with a Piech family member and a Porsche family member to maintain the board's current balance as the clan slowly transitions to a younger generation of leadership. Replacing Hans Peter Porsche is the easy part since he is expected to relinquish his seat to his only heir, Peter Daniell Porsche, a musical therapist, philanthropist and author of a book called "There's more to life than building cars." Replacing Ferdinand Piech is more difficult. The likeliest candidates are his niece Louise Kiesling, who has a doctoral degree in vehicle design from the Royal College of Art in London, or her younger brother Josef Ahorner, chairman and main shareholder of Emarsys, a Vienna-based cloud marketing platform. Both are children of Piech's older sister, Louise Daxer-Piech, who died in 2006. Both have boardroom experience: Kiesling joined VW Group's supervisory board shortly after her uncle resigned in April 2015. Ahorner became a board member at VW Group's premium brand Audi in December 2015. The Porsche-Piech family likes to split up its various boardroom responsibilities among the different Volkswagen-related companies under their control. As a result, a source close to the families said that Kiesling will likely defer to her brother in the case of Porsche SE, allowing Ahorner to gain his first prominent boardroom seat. Porsch SE has been tight-lipped about the plans for its future board. During its annual press conference here last month, Hans Dieter Poetsch, who is Porsche SE's chief executive and also VW Group chairman, said no decisions have been taken on the makeup of the board. Piech is selling the bulk of his Porsche SE stake, worth about 1 billion euros ($1.1 billion), under pressure from other members of his family after he allegedly implicated his family in VW Group's emissions-rigging scandal. According to German media reports, Piech told German prosecutors investigating the scandal that he had informed key VW supervisory board members, including Wolfgang Porsche, his cousin and the family head, about possible cheating on VW's diesel engines six months before the scandal became public. Piech, a grandson of VW Beetle inventor Ferdinand Porsche, turns 80 on April 17. His likely withdrawal from the family investment company will the end game in a bitter family dispute of the kind that has characterized his life and career.